What happened to the letter to Laodicea mentioned in Colossians 4:16? Near the end of Paul's third journey, Paul visited churches and gathered funds for the relief of brethren in Judea sufferring from a famine (I Corinthians 16:1-9). Several of the churches sent representatives to travel with Paul, not because they did not trust Paul, but Paul wanted everything done openly and above board (II Corinthians 8:16-24). Several of these men are mentioned by name in Acts 20:1-4. "After the uproar had ceased, Paul called the disciples to himself, embraced them, and departed to go to Macedonia. Now when he had gone over that region and encouraged them with many words, he came to Greece and stayed three months. And when the Jews plotted against him as he was about to sail to Syria, he decided to return through Macedonia. And Sopater of Berea accompanied him to Asia -- also Aristarchus and Secundus of the Thessalonians, and Gaius of Derbe, and Timothy, and Tychicus and Trophimus of Asia" (Acts 20:1-4). Take special note of three: Aristarchus, Timothy, and Tychicus. The funds eventually were delivered to Jerusalem, but while there Paul was arrested as the Holy Spirit had warned him. After spending several years in prison awaiting a decision by the local rulers, Paul finally appealed to law of Caesar and he was sent to Rome for trial. "And when it was decided that we should sail to Italy, they delivered Paul and some other prisoners to one named Julius, a centurion of the Augustan Regiment. So, entering a ship of Adramyttium, we put to sea, meaning to sail along the coasts of Asia. Aristarchus, a Macedonian of Thessalonica, was with us" (Acts 27:1-2). Luke (a part of the "we" in this passage) and Artistarchus, who had come to Jerusalem with Paul, were Paul's companions on his journey to Rome. While in Rome, Paul wrote three of the letters found in our New Testament: Ephesians, Colossians, and Philemon. There was no formal postal service in those days. Letters were given to trusted messengers who not only saw that the letter reached the proper destination, but who could also fill in the details and answer questions from his personal knowledge of the situation. Tychicus was selected to be the messenger. In Ephesians 6:21-22 we read, "But that you also may know my affairs and how I am doing, Tychicus, a beloved brother and faithful minister in the Lord, will make all things known to you; whom I have sent to you for this very purpose, that you may know our affairs, and that he may comfort your hearts." And in Colossians 4:7-9 we read, "Tychicus, a beloved brother, faithful minister, and fellow servant in the Lord, will tell you all the news about me. I am sending him to you for this very purpose, that he may know your circumstances and comfort your hearts, with Onesimus, a faithful and beloved brother, who is one of you. They will make known to you all things which are happening here." Tychicus is not mentioned in the letter to Philemon, but it is assumed the letter to Philemon was written and sent at the same time as the letters to Ephesus and Colosse because the same sets of people and circumstances are mentioned in the three letters. The verse under consideration, Colossians 4:16, mentions a letter sent to the church in Laodicea. "Now when this epistle is read among you, see that it is read also in the church of the Laodiceans, and that you likewise read the epistle from Laodicea." Most commentators on this passage express the view that this letter must have been lost. Yet, that is a surprising opinion when you think about the care early Christians took in preserving the words of God. We also need to remember Jesus' promise expressed in Mark 13:31, "Heaven and earth will pass away, but My words will by no means pass away." Jesus was stating the certainty of the prophesy that he just made, but it remains that God views his word as permanent. The apostles also say that their writings would be long-lasting. "Since you have purified your souls in obeying the truth through the Spirit in sincere love of the brethren, love one another fervently with a pure heart, having been born again, not of corruptible seed but incorruptible, through the word of God which lives and abides forever, because "All flesh is as grass, And all the glory of man as the flower of the grass. The grass withers, And its flower falls away, But the word of the LORD endures forever." Now this is the word which by the gospel was preached to you" (I Peter 1:22-25). The idea that we have lost a letter that was known to at least two congregations is very disturbing. So, what has happened to the letter to the Laodiceans? Perhaps there is a hint within the three letters that were written at the same time. Look again at Colossians 4:16 and this time include the verse that follows it. "Now when this epistle is read among you, see that it is read also in the church of the Laodiceans, and that you likewise read the epistle from Laodicea. And say to Archippus, "Take heed to the ministry which you have received in the Lord, that you may fulfill it.""" The Colossians are instructed to exchange letters with the Laodiceans and while there they are told to remind Archippus to do his duty as a minister. Arichippus is mentioned only one other time in the New Testament, and that is in Philemon. "Paul, a prisoner of Christ Jesus, and Timothy our brother, To Philemon our beloved friend and fellow laborer, to the beloved Apphia, Archippus our fellow soldier, and to the church in your house" (Philemon 1-2). A church mets in Philemon's house and we learn that Archippus is a fellow solider of Paul's there. In other words, Archippus is the preacher who labors with the congregation that mets in Philemon's house. Commentators on this passage state that the church in Colosse met in Philemon's house. If this was true, that would make Archippus the minister in Colosse. As a member of the church in Colosse, he would have heard the words of Paul's letter to the church in Colosse. So why would Paul tell the Colossians to speak to him when they exchange letters with the church in Laodicea? Archippus would have already heard the admonition. Unless, that is, Archippus was in Laodicea and not Colosse, then the words of Paul would make perfect sense. Let us now consider the verse prior to verse 16. "Greet the brethren who are in Laodicea, and Nymphas and the church that is in his house" (Colossians 4:15). Many have assumed that it was the church in Laodicea which met in Nymphas' house. However, read the verse more carefully and you will realize that Paul is sending greetings to two groups of brethren, not one. He greets the brethren in Laodicea and he sends greetings to the church that meets in Nymphas' house. Back up to verse 13, "For I bear him witness that he has a great zeal for you, and those who are in Laodicea, and those in Hierapolis." Three congregations are mentioned in this verse: the Colossians, the Laodiceans, and those in Hierapolis. Pull out a map and you will see that Hierapolis is six miles from Laodicea. The two towns were in viewing distance of each other across a valley. 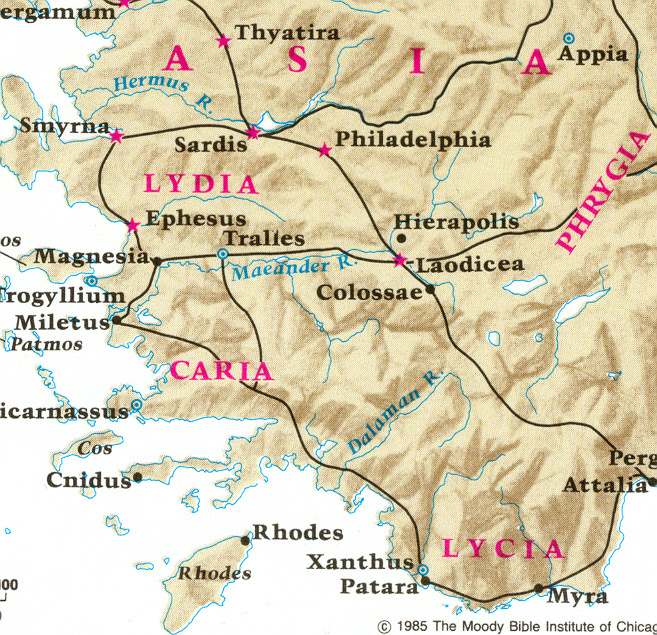 The city of Colosse is eleven miles from Laodicea and thirteen miles from Hierapolis. It makes much more sense to assume that Nymphas lived in Hierapolis and the church in Hierapolis met in his house. The closeness of these three towns also explains Paul's statement in Colossians 4:9. "Onesimus, a faithful and beloved brother, who is one of you." Some have taken this statement to mean that Onesimus was a member of the church in Colosse. However, Onesimus became a Christian while on the lam in Rome (Philemon 10, 15-16). Onesimus was just now returning to the area, so could not have been a member of the church in Colosse. More likely, Onesimus was born and raised in Colosse, making him a fellow native of the region. Perhaps you are beginning to realize the letter to Laodicea is the epistle we call the letter to Philemon. Yet some object to this conclusion because Philemon is a personal letter. Why would Paul ask that it be shared with the Colossians? First, look at Philemon 1-2 again. You will see that the letter is not just addressed to Philemon. It is addressed to Philemon, Apphia (possibily Philemon's wife), Archippus, and the church that meets in Philemon's house. True, the letter is mostly addressed to Philemon, but that personal content does explain the reference to the letter in Colossians 4:16. Paul doesn't call it a letter to the church in Laodicea. He simply states that it is a letter from the city of Laodicea. Still, we need to consider why Paul would want to make a personal letter public. You need to understand that Onesimus was a run-away slave. By Roman law, his master could do anything he wanted to punish him for running away, including torture or making an example of him by having him put to death. It is likely that Onesimus chose to run to Rome, a city almost 1,200 miles away from his home, to be where no one knew him and to blend in a large metropolitan area where strangers were not notable. Somehow Onesimus met Paul and was converted to Christ. Perhaps Epaphras had a hand in the matter. Epaphrus was from Colosse (Colossians 1:7-8) and he was knowledgeable about the churches in Laodicea and Hierapolis (Colossians 4:12-13). He had likely met Onesimus before and knew that he was a run-away slave. Perhaps Epaphras' visit to Paul led Onesimus to confess his past to Paul. However it came about, Paul persuaded Onesimus to return to his master. You see, Paul lived in accordance with the laws of man wherever possible and he urged others to do the same. Despite this, Paul was determined to do everything he could to protect this new Christian. "Therefore, though I might be very bold in Christ to command you what is fitting, yet for love's sake I rather appeal to you --being such a one as Paul, the aged, and now also a prisoner of Jesus Christ-- I appeal to you for my son Onesimus, whom I have begotten while in my chains, who once was unprofitable to you, but now is profitable to you and to me. I am sending him back. You therefore receive him, that is, my own heart, whom I wished to keep with me, that on your behalf he might minister to me in my chains for the gospel. But without your consent I wanted to do nothing, that your good deed might not be by compulsion, as it were, but voluntary" (Philemon 1:8-14). He appeals to Philemon's desire to live righteously and to do what was right. He appeals to Philemon's sympathy for an aged man who is in prison. Paul emphasizes that Onesimus is a Christian now; a Christian who has given personal service to the apostle Paul. He then appeals to Philemon's goodness and his confidence that Philemon would want to do Paul a great favor "voluntarily." Imagine getting such a personal appeal from such an important man! Even if Philemon was furious with Onesimus, we can imagine him squirming under the emotional chains Paul has laid on him. Yet Paul doesn't stop there. "If then you count me as a partner, receive him as you would me. But if he has wronged you or owes anything, put that on my account. I, Paul, am writing with my own hand. I will repay--not to mention to you that you owe me even your own self besides. Yes, brother, let me have joy from you in the Lord; refresh my heart in the Lord. Having confidence in your obedience, I write to you, knowing that you will do even more than I say. But, meanwhile, also prepare a guest room for me, for I trust that through your prayers I shall be granted to you" (Philemon 1:17-22). Paul asks Philemon to treat Onesimus as he would treat Paul. He pledges to repay any debt Onesimus owed Philemon, writing the pledge personally instead of having a scribe copy it down. Paul then casually reminds Philemon that he owes his own life to Paul. In other words, Onesimus could not possibly owe Philemon more than what Philemon owed Paul. Once again, Paul expresses his confidence that Philemon would do more than what Paul asked of him -- don't forget that Paul had hinted that he would like Philemon to volunteer to send Onesimus back to Paul (Philemon 10-14). Oh! and by the way, Paul says he is planning to come by in the near future to see Philemon and to stay a while in his home. Talk about arm twisting! And on top of this Paul addressed this letter to the church in Philemon's house. Since Tychicus delivered the letter, everyone would know its content. Philemon would not even have a chance to play dumb about what Paul had asked of him. Even if Philemon had the slightest inkling to punish Onesimus, he would have to explain himself to his brethren why he wouldn't concede to the wishes of the aged and revered apostle. As if this wasn't enough, Paul made sure that the Colossian brethren had met Onesimus and were made aware of Paul's love for the man (Colossians 4:9). Remember that Paul told the Colossians to share their letter with the Laodiceans and to be sure to ask for Paul's letter that was sent to Laodicea. Philemon would be completely unable to deny the letter's existence. He would have no possible excuse to claim ignorance. And, as a final stroke, Paul sends a personal message to the preacher in Laodicea via the Colossians to remember to do his duty. This was a not so subtle hint that Archippus was to make sure that Paul's will was carried out. The matter between Philemon and Onesimus was a private matter, but Paul made sure that it would be settled publicly. Paul never denied that Philemon had the right to punish Onesimus. He just made it extremely awkward for Philemon to do so. And why not? A man's life was at stake! Could Paul have done anything less? How beautifully, delicately, and tactfully Paul boxes Philemon in so that he could only do the right thing. Can you imagine the conniptions breathren would have today with such letters? Today, the Laodiceans would have told the Colossians to mind their own business. "Churches are autonomous. You can't tell our preacher what to do!" Brethren, we have a duty to watch out for each other, even if our brothers and sisters are members of neighboring congregations.